A century since its founding, the family business continues to thrive and carry on the Ratto Bros. tradition. Four sons of the Ratto brothers now run the operations - in the fields, cooling and distribution facility, sales office and corporate headquarters. The new generation of Ratto Bros. has modernized and expanded the business in a way that has enhanced the company's years-long reputation for excellence. Ratto Bros. now farms over one thousand acres of prime farmland near Modesto, California. 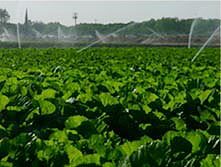 Using progressive farming practices and the latest cold-chain management technology, the company's produce remains among the safest and freshest on the market. The company's success throughout the generations has been a result of the enormous pride the family takes in the quality of the fresh herbs, fruit and vegetables that are delivered to Ratto Bros. customers year after year. While all farming operations have shifted to the Central Valley, the company headquarters remains in Oakland near some of the original farm acreage. The company still retains a horse-drawn cart on its logo as an important reminder of the company's proud heritage.